To wilt or not to wilt? The growth hormone abscisic acid affects the ability of plants to control water loss through their leaves as well as their ability to recuperate after drought conditions. Early growth conditions are crucial to long term abscisic acid levels. You might be familiar with this situation: At the florist you spot a pot of roses. The plant is bursting with flowery vibrancy. You buy the potted plant, bring it home, and proudly place it in a windowsill. It looks lovely! But then, already after a day or two, the leaves and blooms start to sag. What has gone wrong? At Aarhus University the scientist Habtamu Giday Geraegziabher has an explanation. The secret lies in the stomata – the tiny pores on the leaves of all plants. The stomata play a role in water loss and CO2 uptake from the leaves. Habtamu Giday studies the physiology that lies behind the functionality of the stomata and has recently defended his PhD thesis on the subject. He discovered that the plant hormone abscisic acid underlies the differences in certain critical features of plant-water relations. These plant-water relations include control of water loss through the stomata and aspects of restoration of water uptake after the plant has been dehydrated - in other words, whether the plant will wilt or not. Usually, greenhouse plants are raised under relatively high humidity (more than 85 per cent relative humidity) to ensure optimal growing conditions. These conditions ensure that the plants do not risk suffering from water loss through their leaves. The plants respond by maintaining open stomata. The problem arises when such a plant is brought into a consumer's home. Most private homes have a relatively low level of humidity. The plant should respond by closing its stomata to avoid water loss through its leaves. However, this does not always happen. Instead, it is as if some plants have gotten used to having their stomata wide open and have trouble readjusting to their new conditions. This results in dehydration – hence the limp leaves and wilted flowers. The early growth conditions – notably relative humidity – play an important role in this regard. Recent studies have shown that there is a wide genetic variation in the extent to which this phenomenon occurs. Some plants are just better at switching to dry conditions than others after a prolonged period with high humidity. Habtamu Giday wondered what the underlying mechanism is that rules whether stomata open or close. To get a closer look at the how the stomata work under various humidity conditions, he used leaves from potted roses, a tube of silicon rubber and a dab of nail polish. The rose plants were raised under controlled climatic conditions at high and medium relative humidity after which they were exposed to drought conditions. Habtamu Giday took leaf samples from these plants and squeezed a small portion of rubber silicone on the leaves to make a detailed imprint of the leaves and their stomata. He then painted the silicone rubber imprints with a fine layer of clear nail polish to achieve a thin, transparent layer that he could peel off and study under the microscope. Using this method he could gain insight into which conditions stimulated the stomata to open and close. 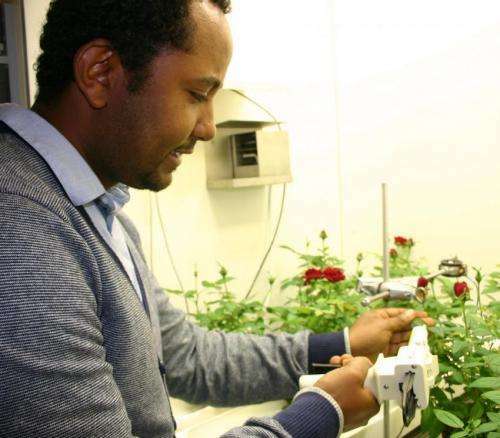 Habtamu Giday found that the roses grown under high humidity conditions had a higher level of abscisic acid and that the high level of this particular growth hormone persisted even when the plants were subjected to drought conditions. "Stomatal responsiveness seems to be determined by the long-term level of abscisic acid which, in turn, is affected by the relative humidity during the early growth stages," says Habtamu Giday. The next question that came to mind was if it possible to take advantage of the variation in this trait that has been observed between cultivars. In his thesis, Habtamu Giday presents two independent possibilities for stimulating stomatal responsiveness at high relative humidity conditions without pitfalls. "The first alternative is to graft onto the rootstock of genotypes with increased levels of abscisic acid at high relative humidity. I found that this can reverse the condition and restore stomatal functionality," explains Habtamu Giday. The other possibility is to water the plants less, in accordance with how much water they evaporate. "We have shown that when plants are irrigated by half the irrigation amount compared to evapotranspiration they show considerably improved stomatal responsiveness without any yield penalty. A further decrease to one quarter of evapotranspiration completely restores stomatal functionality although this improvement comes at a cost of yield loss," says Habtamu Giday. More information: Listen to Habtamu Giday explain his work in the video under the heading "Meet present and former PhD students".